“Hoppy Easter,” reads this sign as a worn out bunny rests in a basket of eggs. The basket is made from a paper plate, folded in half. Patterns for the bunny head, feet, sign, flowers and eggs make this an easy project. Add a little Easter straw and find a place to hang this decoration on the wall with some Fun Tac. 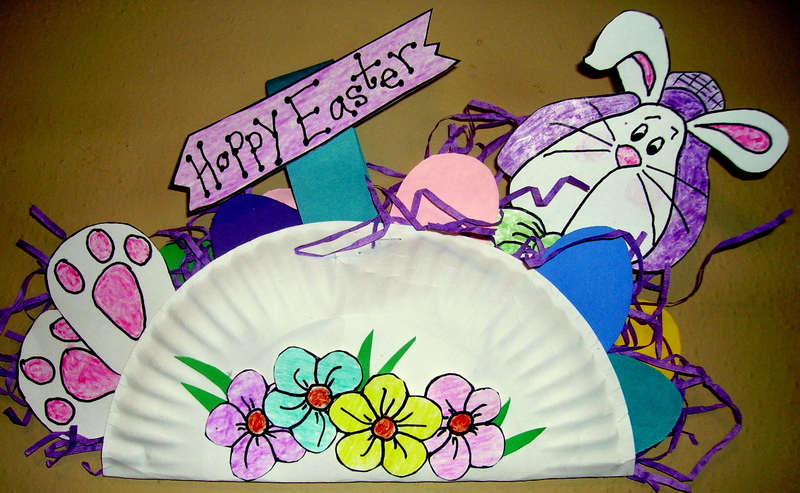 This project, “Paper Plate Easter Basket,” can be found in the Easter Projects Gallery in the sidebar. Click the photo for a full image. This entry was posted in Easter and tagged basket of eggs, bunny in basket, childrens easter crafts, easter basket, easter bunny crafts for kids, easter bunny wall hanging, easter crafts for kids, paper plate, paper plate craft, paper plate easter basket. Bookmark the permalink.